Oceanfront spacieux 3 lit / 3 salles de bain Condo à Cherry Grove! 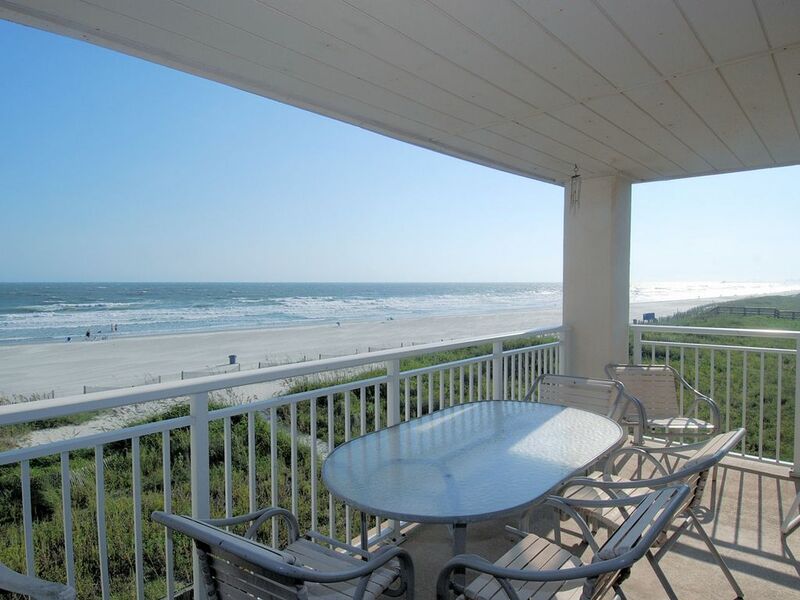 Xanadu II, situé dans la partie Cherry Grove Beach de North Myrtle Beach, offre à ses clients une vue magnifique sur la plage et l’océan Atlantique. Ce superbe condo dispose d'une cuisine entièrement équipée, de meubles de salon confortables, d'une grande télévision à écran plat, d'une connexion WIFI gratuite, d'un parking gratuit pour 3 voitures, d'un ascenseur et d'une vue sur l'océan. Découvrez la vue à Cherry Grove, vous pouvez voir toute la plage! Chambre à coucher principale - Lit King Size avec grande télévision à écran plat, accès au balcon en front de mer, grandes toilettes privées avec baignoire et douche séparée. Chambre à coucher principale n ° 2 - lit King Size, téléviseur à écran plat 32 "et toilettes privées. Chambre d'amis - 2 lits jumeaux, 2 lits jumeaux roulants et télévision à écran plat 32 ". Tous les draps et serviettes de bain sont inclus. Pour votre confort, cette maison comprend une connexion Wi-Fi, une laveuse et une sécheuse, ainsi qu'un parking gratuit pour 3 voitures. Southern Coast Vacations a un personnel de réservation complet qui connaît bien tous les aspects de chacune de nos maisons de location et des zones environnantes. Ils travaillent avec vous pendant le processus de réservation, avant votre arrivée, pour des questions supplémentaires et des informations. Notre personnel est disponible 24h / 24 et 7j / 7. Si vous avez besoin d'aide à tout moment, nous pouvons vous aider! Les serviettes de plage et de piscine ne sont pas fournies, assurez-vous d’en emporter. Nos propriétés sont totalement non-fumeurs. Nous louons aux familles et aux adultes de plus de 25 ans seulement. Nous sommes sympathiques moto et remorque! Unit was not clean, floors not swept, lots of dust on air ducts and blinds. Carpet dirty and needs to be replaced. Entire unit including shower doors and living room furniture need replacing for enhanced appeal. Southern coast staff very nice, helpful. The location was perfect! Condo was on the second floor and very quite. Saw some reviews about it not being clean so we were worried but the condo was clean the sheets came in a plastic bag and we had to put them on so you could tell that they were clean. The furniture was worn but it was perfect for us. Thank you for your kind review, we hope that you stay with us again soon! Excellent location,good fit for family of six with adult children. Ample kitchenware and all appliances. We didn't mind at all that it wasn't updated. It felt homey. We just wish it was clean. We would have called management but arrived late that night. Upon entry, in two bathrooms we found hair on and behind toilets that wasn't ours. We remove shoes at the door, so we were very surprised when within two minutes of putting on a new pair of white socks, the bottoms of our socks were black. There were some fruity pebbles or something on the carpet in MBR by/under nightstand. The mold around the A/C vents caused us to have allergy issues. Balcony was nice and large, however, straps were broken on a couple pieces of patio furniture and glass door had tic tac toe and hearts drawn on in the sea spray. All easily overlooked had the house and carpets been clean. We all thoroughly enjoyed the close proximity to the beach and amazing views from the balcony. Would happily recommend this property if it were clean. This is the second winter we have spent in this unit, it was again a wonderful time. We hope to see you again when you move here! We decided to take a last minute trip to the beach, and I guess that's what we get for planning last minute! We ended up in a very run-down, expensive, dirty condo with NO amenities and very little customer support. We paid for a linen service, but had to make our own beds, the towels were of very poor quality and the beds MISERABLE!! The large jetted bath tub was broken and required a tool to operate the kitchen mat was stuck to the floor due to dirt, and every piece of furniture felt dirty to the touch. The beach was beautiful, the pool was clean (but very cold), and the short walk to the beach from the condo was perfect! So basically, everything outside the condo was good, inside, not so much! We are glad that you enjoyed the location of the condo. The linen package is ordered through a linen company and the bed linens are wrapped in plastic, delivered to the room, and guests do make their beds. We find that most customers prefer to find the linens this way to ensure they are laundered. Many conversations between the guest and customer occurred throughout the booking and arrival process via email because the guest did not provide a valid phone number. The guest was even allowed to check into the condo at noon at no additional cost. There was a report of the timer knob that came off during the guests stay, maintenance was called and offered to replace the timer knob immediately. I am sorry we could not meet your expectations. The location and price for the unit was very good. We stayed right on the beach and there was an elevator in the unit. The appliances were a little outdated but in good working condition. The unit was not cleaned sufficiently when we arrived as there were dirty pans left in the oven that smelled and there was butter in the butter tray left in there that was going bad. The shower door in the master bedroom fell off the first time it was opened. It was easy to put back on track though. Also the linens that were provided and "pre-cleaned" had pubic hair on them and I had to wash them again before use. That was pretty disgusting. The furniture in the main area was outdated, a little warn, but clean. The unit over all was fine but I wish it was cleaned better and that the linens weren't dirty. I am not sure I would renew with southern coast vacations because of the cleaning service they use. The unit was also outdated but maybe that was reflective of the lower price. We are pleased that you enjoyed our convenient location at a price that you could value! Thank you for pointing out things we can improve on as well. We take our guest feedback quite serious; as it relates to housekeeping. We will notify the linen company immediately, as we are constantly working with our team to improve our service. We would have brought you more linens immediately, I apologize for the inconvenience. We hope to have you stay again! We are grateful for your feedback and hope that you will back to see us again soon! Les prix sont basés sur la saison. Pendant la haute saison (juin, juillet et août), la plupart des propriétés seront louées du samedi au samedi uniquement.